The OPEC headquarters in Vienna. Photo by DALIBRI, Wikipedia Commons. The mere mention of OPEC is almost instinctively accompanied by an automatic reference to the Kingdom of Saudi Arabia, as if the two are practically synonymous. As an oil producer, Saudi Arabia is in a league of its own within OPEC. Saudi Arabia produces over 10 million barrels per day of oil which is around the same amount of production coming from Iraq, Iran, and Kuwait combined. 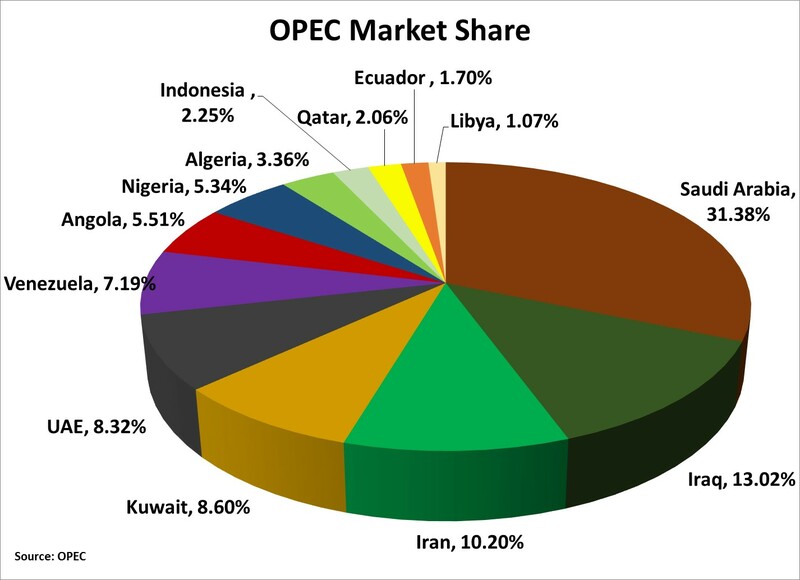 Needless to say, Saudi Arabia has acted as the unofficial leader of OPEC. Saudi Arabia’s domestic oil production policy clearly influences and is invaribly reflected in the decisions coming out of OPEC meetings. In the midst of the current continued policy of Saudi Arabia and OPEC to keep pumping to preserve market share, a developing dynamic within OPEC may cause dramatic change in power and leadership. 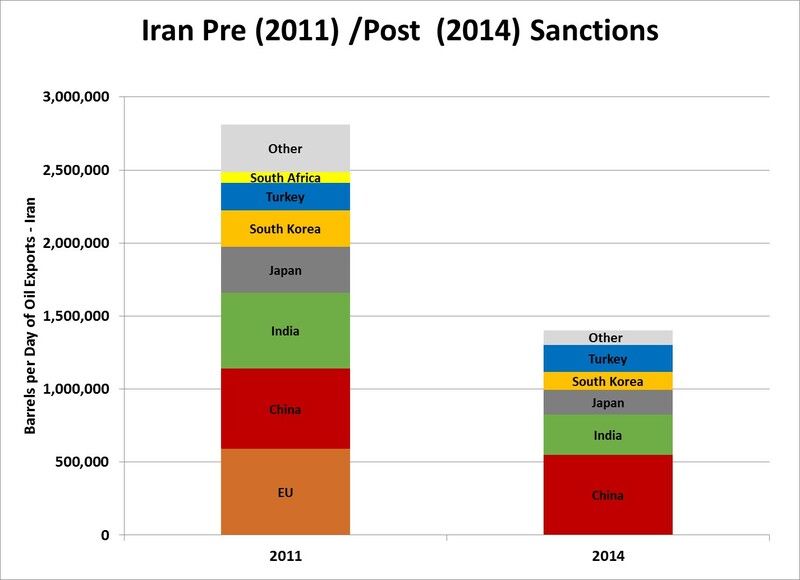 For some time now Iran has been subjugated to sanctions which have not only prevented its oil production from reaching the U.S. and Europe, but also created dramatic declines in exports to China, India, and Japan. Even as Iranian sanctions were lifted in 2015/2016, the country remains steadily behind in production growth from its largest OPEC competitors Saudi Arabia and Iraq. While Saudi Arabia and Iraq increased production from 2010 by 15% and 90% respectively, Iran has lost 17% of its production. 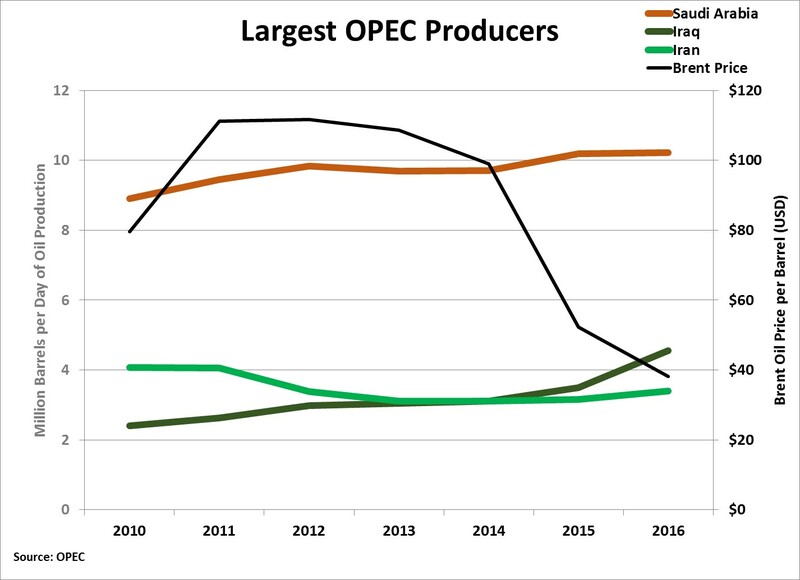 This meant that not only was Iran losing market share to its closest OPEC competitors, but the country was missing out on growing production in one of the highest priced oil environments from 2011 to 2014. In a battle for market share, Iran has been struggling as they are just beginning to build up market share around the world. 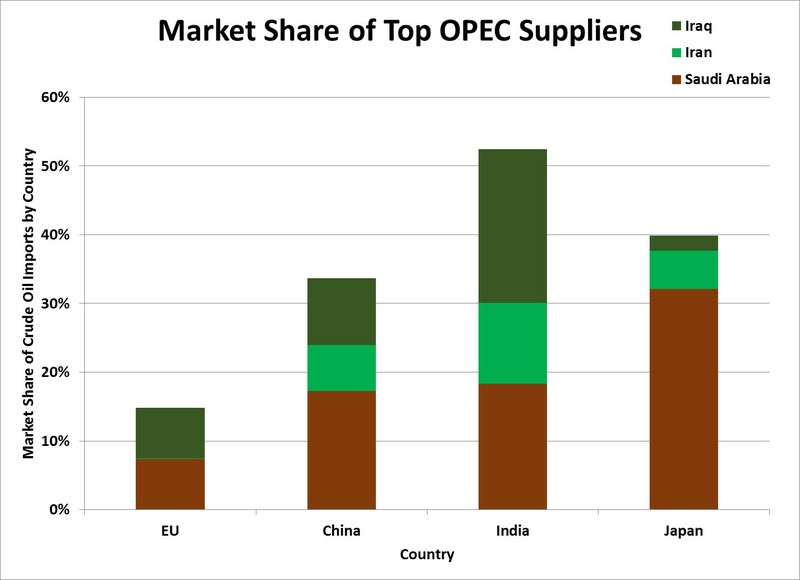 Much of the global fight for market share is occurring in four key markets that make up 36% of global oil demand: the European Union (EU), China, Japan, and India. Sanctions imposed on Iran’s oil exports led to that country not being able to compete with its direct competitors within OPEC. This gave Saudi Arabia the opportunity to ramp up production and grow market share in the four key markets. Additionally, Iraq was able to almost double production from 2011 and gain significant market share in the EU, China, and India. From 2011 to 2014, Iraq increased market share in the EU from 3% to 7.5% and in China from 4.7% to 9.7%. Since the lifting of sanctions in 2015/2016, Iran has been in the process of making critical oil & gas investment decisions that could not only change its position in the global market, but also make it a much larger competitive threat to the leadership of Saudi Arabia in OPEC. The critical investment decisions being made by Iran as it relates to its oil & gas industry involves the country’s shift towards embracing foreign investment. Originally, Iran had tried to attract foreign investment in oil & gas fields through a “buy back” investment model for the exploration and development of Iran’s fields. Essentially International Oil Companies (IOC) would explore and develop an oil & gas block and the IOC would then hand over the project to the National Iranian Oil Company (NIOC) at production. If successful, the IOC would be reimbursed for pre-determined funds spent on the project based on a rate of return of 15% to 17%, but would not be reimbursed for cost overruns, increases in production, or excess exploration risks. The problem with the “buy back” model was that IOCs took on all the risk of exploration and development and had limited upside as the companies could not participate in the production of their projects. Additionally, these exploration and development contracts lasted only 3-5 years. IOCs would not get a stake in the project they explored and developed and could not book reserves on their balance sheet. Iran introduced a new Iranian Petroleum Contract (IPC) model in November 2015 that will result in a major shift away from its original “buy back” contract model employed for the past 20 years. The new contracting model structures investment in Iran’s upstream oil & gas sector by way of Joint Venture (JV) where the NIOC will own at least 51% of the JV. This model requires the involvement of the IOC at the exploration, development, and production stages – leading to IOCs participating in the upside of their discoveries and development. Contracts between IOCs and the NIOC will last 20-25 years and provide payment flexibility on the risk taken to explore and develop difficult fields. Once the JV project is in production, the IOC will receive a payment for its service by a measured volume of production and the NIOC will repay costs during the exploration and development stage. A JV management committee, made up of members of the IOC and NIOC, will review costs from the exploration and development stage annually in order to approve any necessary cost overruns. IOCs participating in the production of projects brought through commercial development is a big step for Iran. The new IPC is a modified form of a production sharing contract (PSC) in order to abide by the Iranian Constitution which does not allow production sharing. PSCs have been implemented in Iraqi Kurdistan, Oman, and Egypt where production is split between profit and cost oil. Profit oil is usually 40%-60% of production and is split 70%-85% toward the National Oil Company and the remaining profit oil goes to the IOC. Cost oil is used by the National Oil Company to recover operating costs and is usually 40%-60% of production – any surplus in profit from cost oil is usually shifted to be split from profit oil and any cost recovery shortfall can be recouped in the following years. For Iran’s new IPC, cost oil is expected to be covered through a maximum of 50% of annual production from the JV. Although there is no profit sharing under the IPC, the service fee paid through volumes of production annually can be considered the profit oil from a traditional PSC. The IPCs from Iran are not without faults. The ambiguity of the IPC leads to many questions as it relates to base fees paid to IOCs, the oversight and qualifications of the JV management committee, clarity on the independent sale of production, and whether or not companies can book reserves on their balance sheet. An important issue for IOCs is the booking of reserves as this gives companies increased value and the ability to leverage reserves for financing. Under the Iranian Constitution, all the country’s energy reserves belong to the state. The IPC may maneuver around the Iranian Constitution, much like with the concept of production sharing, by using the long-term production contracts of 20-25 years as a way to book the contract as an assets similar to the booking of reserves – this is currently being done in Iraq. While Iran’s IPC has certain ambiguities, the NIOC’s Managing Director, Roknoddin Javadi, hopes to clarify these issues as the NIOC plans to have an IPC draft completed by July 2016 so Iran can open bids for its blocks. This transition from a “buy back” model to a virtual production sharing contract puts Iran in a unique position within OPEC. 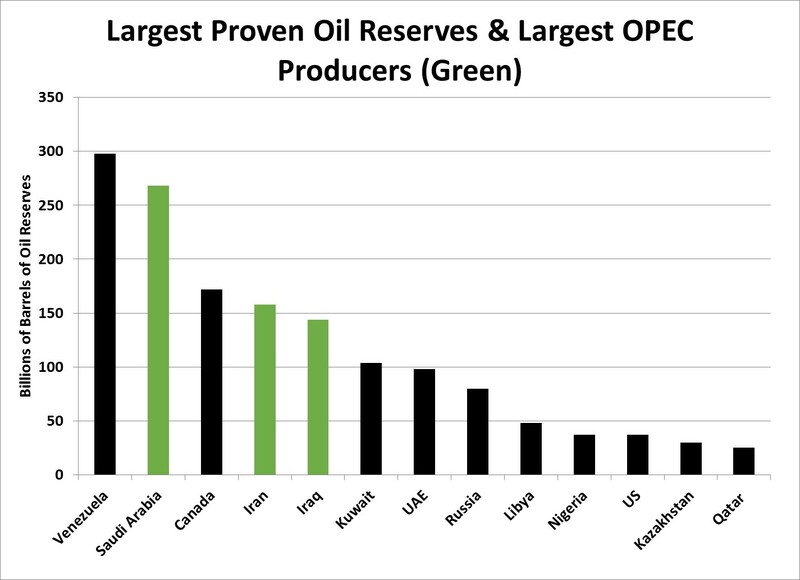 Iran holds the 3rd largest oil reserves in OPEC and would be the only country between the top three producers in OPEC to significantly open its markets to foreign investment. Saudi Aramco, Saudi Arabia’s national oil company, has remained a sole proprietor of Saudi Arabia’s producing onshore fields and Iraq has opened itself to IOCs in a very limited form through service contracts that have seen IOCs reluctant to invest in Iraq unless contracts are changed. Iraq pays its IOCs a fixed value fee equivalent to barrels of production for their service in Iraqi oil fields from the oil the Iraqi government sells. Part of the development costs is split between the Iraqi government and the IOC and both the Iraqi government and the IOC operate the field through a JV. However, companies like British Petroleum (BP) and Royal Dutch Shell (RDS-A) are requesting better terms on their contracts with Iraq as they prefer a model similar to a production sharing contract. The lower oil price and ongoing threat of Daesh in Iraq is forcing the Iraqi government to miss payment for services to IOCs, cut its oil budget and, in turn, force IOCs to cut their own development budgets. British Petroleum (BP), Lukoil, Eni Spa (E), Exxon (XOM), and Royal Dutch Shell (RDS-A) were asked to cut their 2016 development capital by a cumulative 33% from 2015 levels. Based on these cuts, BP and Shell have indicated it will be difficult to ramp up production into 2016 and will require more attractive terms to keep investing in Iraq. Iran’s preemptive shift to an IPC similar to a production sharing contract has put Iran in a unique position. If the IPCs are deemed successful in bringing in foreign investment by IOCs, Iran’s adoption of global technology and innovation in the oil & gas industry will directly compete with the efficiency of Saudi Aramco. OPEC could see a dramatic shift in power as Iran invites more investment into the country’s upstream, midstream, and downstream segments of the oil & gas industry. The adoption and support of IOCs and the technology they bring to Iran’s aging fields and infrastructure could catapult Iran into direct competition with Saudi Arabia, surpassing Iraq, and encroach on Saudi Arabia’s established market share. This could push further opening of oil & gas markets in Saudi Arabia, Iran, and Iraq or see a globalized Iranian oil & gas industry as a competitive dichotomy to Saudi Arabia’s domestically insulated industry. Just as OPEC lost control over global oil production with increased production, technology, and innovation from the US in 2011, Saudi Arabia stands to lose its control over OPEC as Iran’s oil & gas industry opens to technology and innovation, resulting in increased production.